Ibrox Noise: Is Stevie G about to take a huge risk on CL regular? Is Stevie G about to take a huge risk on CL regular? Over the past 24 hours information has reached us of Steven Gerrard’s apparently renewed interest in Fenerbahce’s Martin Skrtel. Hyped hugely last summer as Stevie’s big marquee signing, Skrtel failed to douse the story by posting cryptic social media entries before his agent then went public announcing Rangers simply couldn’t afford him. We’re talking, of course, a 34-year old defender in a very rich league receiving upwards of £60pw so most fans were quite happy for Gerrard to move on, having been seemingly priced out. 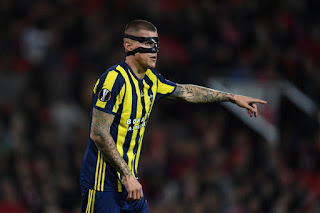 And from scouting reports we’ve heard, Skrtel has had a pretty horrific time in Turkey’s Super Lig, with his performances taking a huge dip while his side languish near the foot of the table. 1: The financial situation has changed and Skrtel will take a massive wage cut. 2: He really, really wants the Slovakian international. 3: Joe Worrall may still leave this window. The Old Firm result changed a lot – Worrall stepped up, while Connor Goldson continued his recent return to some solid form. Meanwhile Gareth McAuley has been frequently outstanding, strolling through his matches increasingly in his sleep (something which helped Goldson’s form too) and of course there’s Nikola Katic, who we know to have the ability but who lacks favour currently. Which means we cannot fathom why we’re in for a defender whose best days seem to be behind him. Sure, he’s a world class player, or was, but the SPL has reduced some great stoppers to absolute ‘mince’, and we only have to look at Bruno Alves for an example of this. He’d have to take a truly huge pay cut, which in all fairness Steven Davis was reported as having done, but we suspect Skrtel’s current pay is higher than Davis’ previous wage was. So any reduction would be vast. And the reality is – do we need a 34-year old at the back? We might have justified it last summer, but now with four seemingly fine options at the back it’s less warranted. Still, if Martin Skrtel is going to come to Ibrox for a very modest wage then who are we to object? He was too good for us THEN. We're too good for HIM, now. Forget him. I'm worried about where all this £££ is coming from, as it is. We need checks and balances, to make sure admin2, never happens to us, again. If Skrtel has only 6 month left on his contract he's very unlikely to earn another contract anywhere for more than half that money. I think Fenerbahce would be happy to release him for free now to save money and at 30k a week (hopefully less) an 18 month contract would cost us around the 2.2 million mark. Not silly money if Worrall is returning to Forrest but unnecessary if Worrall is staying. 34 isn't that old for a CD & Gerrard must know about how well he looks after himself so you'd expect him to have a couple more good years in him. Don't know if this would be a good move or not, and am inclined to say not, but it shouldn't be ruled out just on wages. Should we really be paying £30k a week (£1.56m a season) to a 34 year old who has had a horrific season in Turkey with the "expectation" he has a couple of seasons in him? No. No No. Do we learn nothing from our previous mistakes? I totally agree with you but like the Defoe situation this is a rumour that keeps coming back. I'm not even totally convinced that it was right to sign Defoe but I hope he proves me wrong and the personal knowledge Gerrard has of the player makes me want to trust his judgement. I think it's the same with Skrtel and if Worrall leaves this just might happen. Let's not be too critical of trying to make the most money they can out of a fairly short career. He owes Glasgow Rangers nothing. What would you do in the same situation?